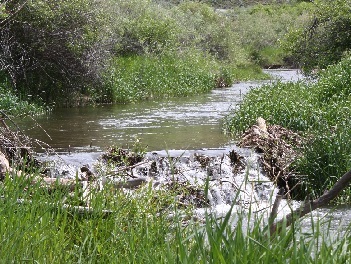 Thistle Creek is a small stream located in Spanish Fork Canyon that contains an abundant population of Brown Trout which in recent years have begun to stunt because they are overpopulated. The Utah DWR occasionally stocks this stream with catchable sized Rainbow Trout as well. Much of the stream is bordered by private property, but there are some public access areas as well. Make sure that if you go that you do not trespass on private land or leave trash or litter along the stream or parking areas. Thistle Creek can be a challenge for fly fishing due to the tight space with lots of overhanging trees and bushes. It can be fished very effectively using small worms or spinners. From I-15 take the Spanish Fork/Hwy 6 Exit and head Southeast on Hwy 6. for 10-15 miles. Turn right at the Thistle turnoff (onto Hwy 89) heading South. Follow the highway for a couple miles. The stream will begin to parallel the road shortly.